Activity : design and marketing of image processing software, design, marketing of electronic components. Comment : Judgment declaring the opening of a bankruptcy proceeding, date of cessation of payments on January 15, 2018 appointing administrator Selarl Fhb Mission Conducted By Me Hélène Bourbouloux 16 PLACE IRIS TOUR CB21 92040 Paris Defense Cedex with powers : assist, legal representative Selarl C. Low Mission Conducted By Me Christophe Bass 171 AVENUE CHARLES DE GAULLE 92200 Neuilly-sur-Seine. The claims are to be declared, within two months of this publication, to the Judicial Agent or on the electronic portal at www . Creditors-services. com. Oh, no, what will Tony and Chelsea do now? On March 7, 2018, DxO Labs chose to file for Chapter 11 Bankruptcy Protection and is now in the process of restructuring the business. In June, we will release a free update (version 1.2) of our flagship software, DxO PhotoLab. Recently awarded the TIPA 2018 Award for Best Image Processing Software, this latest version of DxO PhotoLab will include improved local correction features, and will add support for 7 cameras, including the Canon EOS 2000D and the Sony A7 III. This release will also be an opportunity for us to reiterate our commitment to the “perpetual license” model (as opposed to a subscription model) that allows our customers to update their products according to their needs, rather than in a constrained manner. In June, we will release the new version of the Nik Software Collection, which DxO acquired from Google at the end of 2017. Much awaited by the Nik software community, this first “by DxO” version focuses on fixing bugs that up until now could disrupt the user experience, as well as on ensuring full compatibility with the latest Mac OS and PC platforms. Recently awarded the 2018 TIPA Award for Best Image Processing Software, DxO PhotoLab (formerly DxO OpticsPro) offers a complete RAW and JPEG processing solution based on optical corrections from mathematically established laboratory models, as well as such exclusive features as PRIME noise reduction technology and DxO Smart Lighting intelligent exposure optimization. DxO has integrated Nik Software's U Point technology, acquired from Google in late 2017, into DxO PhotoLab. This exclusive technology allows photographers to apply local settings in a non-destructive RAW stream to specific areas in an image. 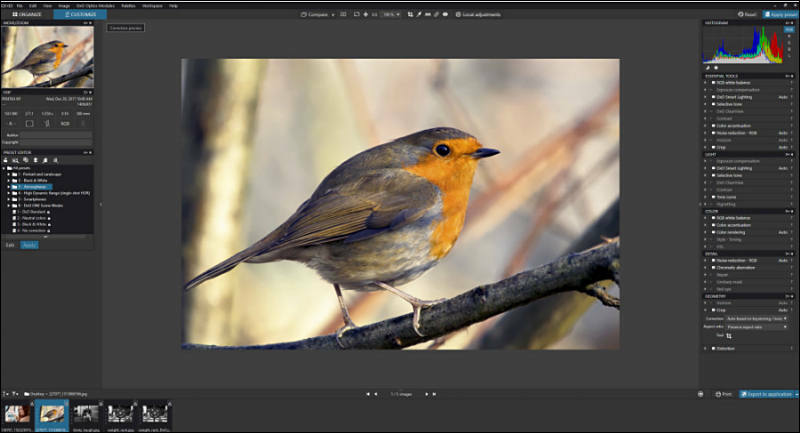 With version 1.2 of DxO PhotoLab, DxO continues to enhance its software by adding the Hue (HSL) and Selective Tone settings, to unblock locally dark areas or recover overexposed areas. The tool's equalizer system has been redesigned accordingly, and local settings are now grouped by categories: Light, Color, and Detail. Each category can be shown or hidden with a single click, for an efficient workflow. In response to user requests, we have added a new keyboard shortcut that displays the U Point mask in grayscale and shows the area that will be affected by the correction. Finally, DxO PhotoLab 1.2 adds support for images from the Sony A7 III; the Panasonic Lumix DMC-G9, TZ90, and GF9; the Canon EOS 2000D; and the Apple iPhone 8 Plus and iPhone X. Thanks to the quality of DxO PhotoLab's RAW conversion, which is based on prior calibration of each sensor in the laboratory, images taken with these cameras and smartphones will automatically be corrected for optical defects. The ESSENTIAL and ELITE editions of DxO PhotoLab (PC and Mac) are available for download on the DxO website (http://shop.dxo.com/), and from retailers at $129 / £99 / €129 and $199 / £159 / €199, respectively (recommended retail prices). Photographers who own a version of DxO OpticsPro can acquire an upgrade to DxO PhotoLab by logging into their customer account at www.dxo.com. A fully-functional trial version of DxO PhotoLab, valid for one month, is available on the DxO website: https://www.dxo.com/us/photography/download.